Sewells Aftersales Management described SMA as "the best consultancy idea for Parts departments for a long time". SMA is a unique, tested programme that appraises a dealer's stock profile and how well it is managed. 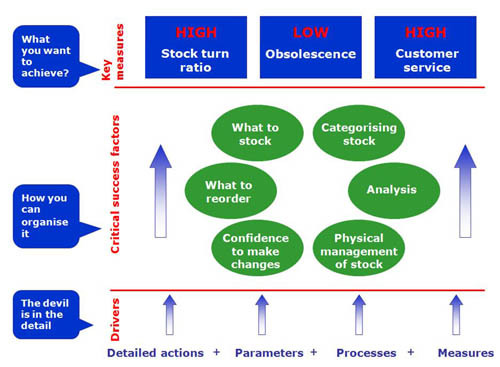 As independents, we designed SMA so that dealers can better achieve the three key measures of good stock management – customer service, stock turn and obsolescence. Supporting the three key measures are six critical success factors and 42 drivers. See the graphic below. The appraisal consists of three stages: a user-friendly, self complete questionnaire by the person responsible for stock management; our assessment (see below) and a written/graphic report identifying detailed development areas. We compare the individual dealer results to targets and peer group average. We have carried out more than 200 SMAs across ten franchises in the UK and Ireland. SMA has benefited both VMs and franchised dealers. Based on this extensive research, we have written a book on the subject "Hidden Treasure (or just a load of old junk?)". See our Publications page under About Us for more details.